Glory Denied is, on the surface, the story of a POW during the Vietnam War. As important to this production as Thompson’s imprisonment is that of his wife, Alyce whose prison bars of society, matrimony and motherhood are not as obvious as those of a POW cell. The act of Thompson building a dream home in his mind becomes the conceptual framework. 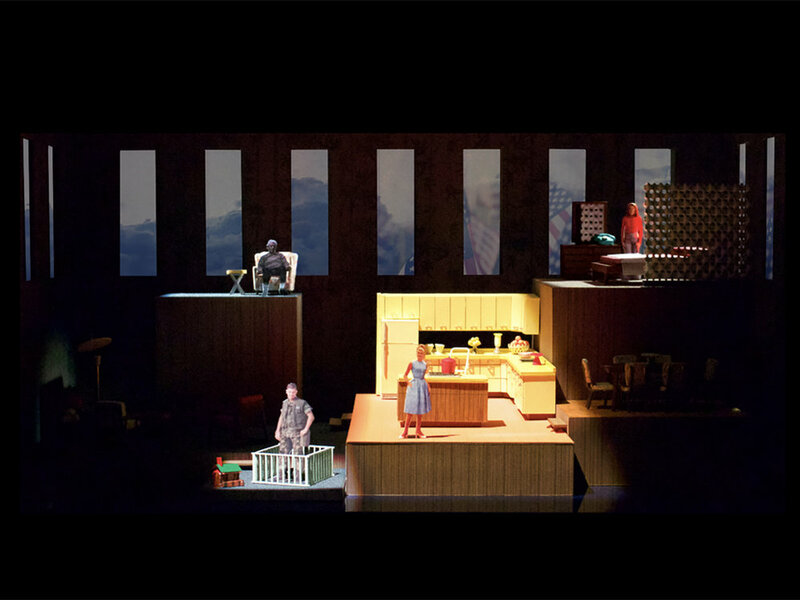 The piece is set in a “typical” ‘60s American dream house and treated to double as a prison. A concrete example is the use Asian-inspired room-divide screens that were vogue during the 60’s, but when treated differently with lighting and projection become an oppressive prison wall. This allows for a unit set and provides the opportunity for quick transitions of time and space as is necessitated by the structure of the opera. Eye-of-the-beholder doubling aids in dealing with an era that a contemporary audience has a strong opinion about. We create a world steeped in its time, freeing an audience of its preconceptions and allowing them to see the toll this environment has on a relationship as well as sounding honest — rather than hyperbolic — resonances and dissonances between then and now. Stephan Moravski (scenic) is a set and production designer based in downtown Manhattan completing his MFA at Tisch School of the Arts, NYU. He completed his Master of Architecture at the University of Melbourne, giving him the opportunity to travel to India to study modernist architects and to paint his way across the South Australian Outback, before completing his thesis in Indigenous Australian architecture and moving to New York. Stephan’s recent designs for theatre include ‘Don Juan,’ Bard College, ‘I wasn’t going to tell anybody and then I told everybody,’ a new play by Adam Bock, NYU, ‘Eurydice’ at NYFA, and ‘Passion Play’ at Muhlenberg College. His short film “Quantization Nation!” won best production design at the First Run Film Festival. Stephan has assisted Opera designer Paul Steinberg and freelances as a design consultant in creative visual merchandising at Tiffany & Co. Stephan has a Ukrainian heritage, and has a strong connection to Ukrainian culture. He is currently the resident designer at Lehenda Ukrainian Dance Company. Abigail Hoke-Brady (lighting) is a New York based lighting designer. Recent projects include ‘This Takes Place Close By' at the Knockdown Center with ThingNY, 'Avalanche 19' with Gregory Dolbashian, ''59RPM' with Current Harbor, and NY Times Critic's Pick 'Bears in Space' at 59e59 with Collapsing Horse. Current and upcoming projects include ‘The Wolves’ at Williams College, ‘but, love’ at The Irondale Center with ChristinaNoel and the Creature, a piece in development with The Lonely Painter Project to be performed at Ars Nova’s ANT Fest, and associate lighting supervisor with Dance Theatre of Harlem. MFA NYU ’16. Liene Dobraja (costumes) is a Latvian-born costume designer for theatre and film. She has worked in Germany, Russia, and the Baltic States, and now works and resides in New York. Trained as a Fine Artist and a graduate of the prestigious Academy of the Arts in Riga, Latvia, Liene has found her place in costume design, and has been designing for theater, opera, film and advertising since 2008. She holds and MFA from NYU in Costume Design for stage and film.